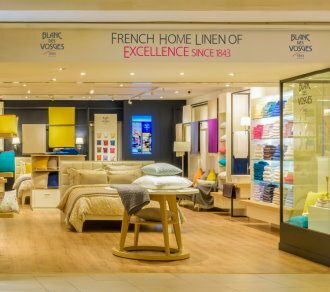 Maison of Excellence since 1843, Blanc des Vosges offers an elegant and comprehensive collection ranging from chic bed linen to soft bath towels, colourful cushions, throws and home fragrances. Blanc des Vosges is recognized for its French handmade, finely stitched linens, and light, breathable material of 100% combed cotton. With its pure colours and elegant designs, Blanc des Vosges celebrates with passion the French Art de Vivre. Come and visit us to bring a French touch to your home!